Welcome to Tuesday here at SuperPhillip Central. Today we have a new review to share with you, one that is for a game that released this past Friday here in North America. It's the return of Donkey Kong Country Returns in Donkey Kong Country Returns 3D. Grab your rocket barrels and get ready to go bananas! 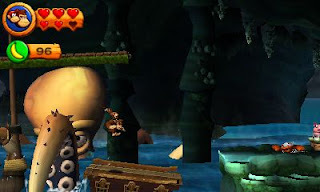 In 2010 the original Donkey Kong Country Returns released on the Nintendo Wii. The game was made by the same developer that worked on all three Metroid Prime games, Austin, Texas-based Retro Studios. The game received high praise across the board from multiple media outlets, and even SuperPhillip Central gave it a golden score. 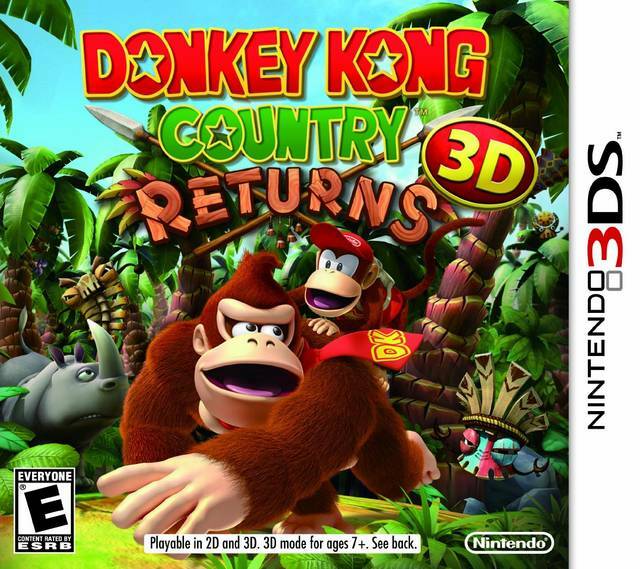 Now it is three years later and Nintendo has opted to task Monster Games with porting the Wii game to the Nintendo 3DS in the form of Donkey Kong Country Returns 3D. Is a return to the DK Isle something recommended? 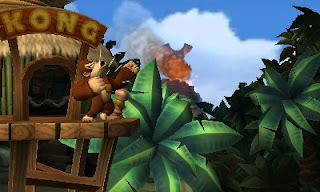 Donkey Kong and Diddy Kong are sleeping when the volcano at the center of DK Isle erupts, shooting out members of the Tiki Tribe, the new villains made especially for Donkey Kong Country Returns. Like the Kremlings before them, the Tiki Tribe with help from the hypnotized locals steal Donkey Kong's banana hoard. One of the tribe members even tries to cast Donkey Kong under its spell, but this proves to be an effort in futility, as DK punches the Tiki Tribe member out of his pad. It's time for DK and Diddy to go after the Tiki Tribe and see exactly why they stole their bananas. Oh, yeah. It's definitely on like Donkey Kong! Donkey Kong Country Returns 3D shares many elements with its Wii big brother. However, there's plenty of changes to be found in this revamped version of the game. The biggest of which is the addition of New Mode. This mode gives Donkey Kong and Diddy Kong an extra heart to work with, as well as new items to purchase at Cranky Kong's shop. These include a DK Barrel that can be summoned at any time, a green balloon that for one time only saves Donkey Kong from falling into a bottomless pit, and finally an item that serves as a free hit during the mine cart or rocket barrel segments of the game. No worries if you don't care for this decidedly easier mode (and even then it is still quite challenging to beat! 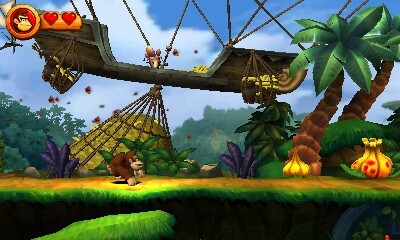 ), as Donkey Kong Country Returns 3D features the standard Wii mode without the helpful bonuses. Another cool change in Donkey Kong Country Returns 3D concerns rolling, ground pounding, and blowing on certain objects. In the original Wii version, you had to shake the Wii remote and/or nunchuk controller to perform these actions. This is no longer the case in this updated 3DS version, where all you need to do is press a button. The only drawback I noticed with this is that you need to be already moving to initiate a roll. This is unlike the SNES Donkey Kong Country trilogy because you have to be moving to roll. If you're on a narrow platform with little room to maneuver, rolling can be next to impossible to do. Other than that occasional issue, the controls in Donkey Kong Country Returns 3D have been much improved over its Wii predecessor. There are eight new levels developed specifically for the Nintendo 3DS version of Donkey Kong Country Returns 3D. Each one is based off the eight world themes in the regular story mode. 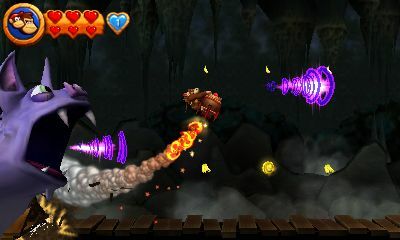 However, these can only be played after all of the gems have been collected from the super-challenging K levels in the game (which are unlocked via acquiring all of the KONG letters from each level in a given world), or if you're playing in New Mode, the gems can be purchased from Cranky Kong's shop for 50 Banana Coins apiece. 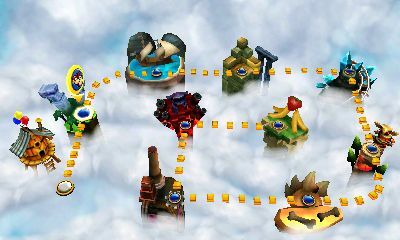 A map of the new levels in DKCR3D. These levels are just as masterfully designed as the ones that Retro Studios manufactured. You'd be hard-pressed to ask someone who had never played both the Wii levels and the 3DS levels whether or not a different developer worked on them. They're that consistently spectacular. as the ones Retro Studios crafted. As for the original levels included with the game, these are as cleverly designed as those who have played the Wii version remember. The magnificence of the design shines through as each level introduces a new gameplay concept or remixes an old one to make something familiar seem fresh and new. There's levels where you alternate between riding a mine cart and clinging to vegetation; levels where you are pursued by an infestation of spiders; and a level where you must dodge the spiked tentacles of a giant octopus. This octopus is enraged at Red Lobster commercials. Each level houses numerous collectibles to optionally acquire. 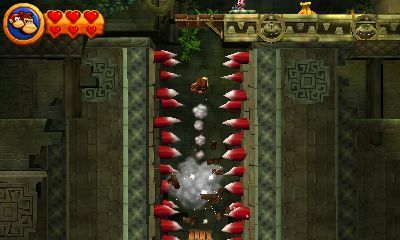 There are bananas (100 of which grants DK and Diddy an extra life); Banana Coins, which are to be spent at Cranky Kong's shop; red balloons that automatically give you an extra life; KONG letters that open up the way to the aforementioned K levels; and Puzzle Pieces, which are hidden away very well in each level. There's generally 5, 7, or 9 pieces in each level to discover. Collecting all in a given level unlocks concept art in the Extras menu. Animal pal Rambi returns into the fray. 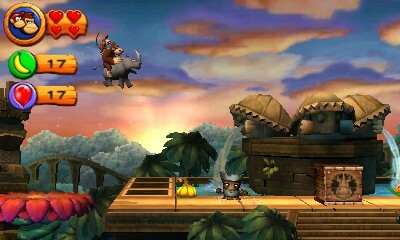 What the Nintendo 3DS brings to Donkey Kong Country 3D Returns is something quite special. The stereoscopic 3D of the system makes the world of the game pop out to the player remarkably. Things such as rolling into an enemy sends them flying toward the player. The multi-tiered levels where DK and Diddy are moving from the foreground to the background and vice versa looks exceptional in 3D. This is one of the better showings of the Nintendo 3DS' stereoscopic 3D technology to date. This creature's going to drive Donkey and Diddy batty! Perhaps the only issues with the presentation are when DK and Diddy are shot into the background. These segments were obviously meant for a regular television screen as the two Kongs shrink down to a very small size. When you factor that in along with how small the 3DS screen is in general, it can be difficult to see what you're doing sometimes. In addition to that, the frame-rate of Donkey Kong Country Returns 3D is halved compared to its Wii predecessor. Not only that, but the frame-rate dips by a few frames noticeably during gameplay. That said, these issues don't ruin this truly excellent title. It's hard to gauge which version of Donkey Kong Country Returns is the definitive one. In defense of the Wii version, that allows two players to much more easily go through the adventure mode together without requiring two systems and two copies of the game, as well as a faster frame-rate. That notwithstanding, the 3DS version adds waggle-free controls, New Mode, and eight fantastically crafted levels. I would go so far to say that both versions are worth owning for different reasons. If you're a 3DS owner who has yet to play Donkey Kong's latest platforming adventure, swing over to your local retailer and purchase Donkey Kong Country Returns 3D. It is one of the best 2D platformers ever created, and the Nintendo 3DS version is tremendous. Get it and then it'll be on like Donkey Kong.